Laos was never supposed to be involved in the Vietnam War. It was supposed to be off limits to all outside countries, including the USA and the Soviet Union, and have its neutrality respected. But, the “Ho Chi Minh Trail” that the North Vietnam military used to supply its troops fighting in South Vietnam ran along the Laos boarder. So….the USA forces dropped a lot of bombs on certain parts of Laos. 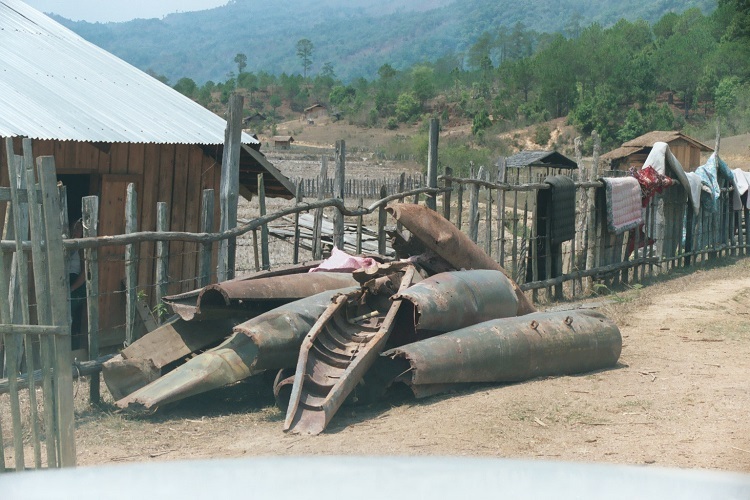 Even when I began working with our development programs in Laos in 2005, it was still very common to see metal bomb casings along side the roads, waiting to be sold as recycled metal. There is even a bomb museum in one of the rural towns where we have an office. As a result of war and politics it has taken the country of Laos a long time to recover. Huge poverty challenges have to be overcome. We are privileged to be a small part of that recovery story. We are able, with lots of help from the European Union, Tear Australia, the Lao government, Foods Resource Bank, and others to facilitate the building of primary schools for villages where literally, no children have ever gone to primary school before! 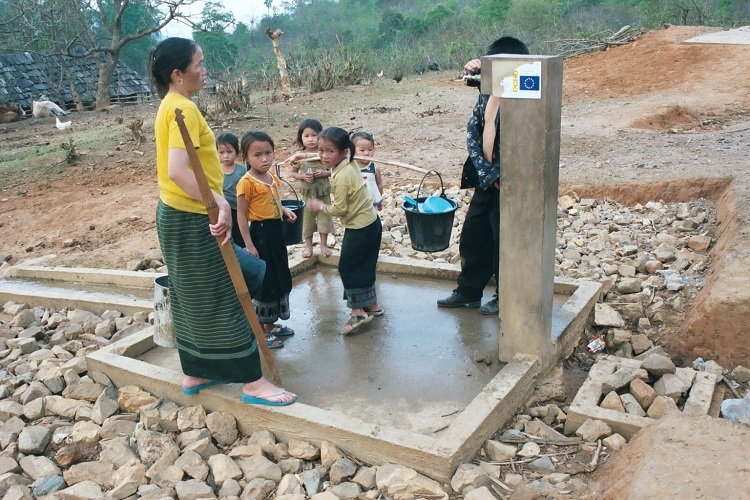 And, we have been able to bring water from mountain streams down to storage tanks near the villages. We’ve been blessed with many special people as staff people. Most are Lao staff, including several who are government employees that are seconded to work with us. Others are foreigners who are dedicated to the work in Laos. Alan is one of those people. He worked in Asia something like 35 years. He’s at home with villagers in Laos and Thailand and clearly shows that he loves the people and being with them. He has worked on many ways of making life better for the people: grafting fruit trees, planting coffee to be a substitute for growing opium, and helping to make life easier for girls and women who by improving their water supply. 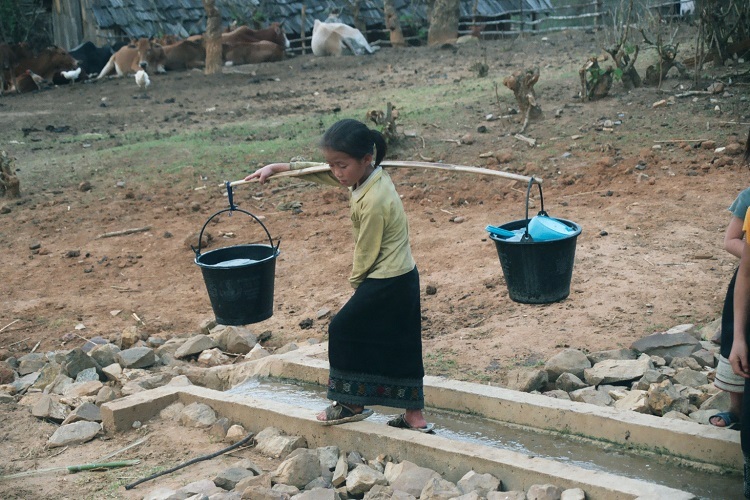 Here’s a picture of what a young girl’s water carrying often looks like. You’ve got to know that the hills are very steep and imagine yourself carrying weight uphill when you were about 8 to 10 years old. This is a little link to a video that shows Alan teaching people how to make ferro-cement water tanks to catch rain water. This will reduce the work involved in carrying water. At least in the rainy season water will be close to the home! Along the way you will gain a good feeling for what it’s like to be in a village in the mountains of Laos.